The community of Our Lord Christ the King was divided into three buildings—church, parish center, and school. The church worked with HGC Construction and Luminaut to create a new addition that brought the community together, physically and spiritually. Stanton Millworks was selected to create the custom wall paneling and welcome desk in the new main lobby, which acts as a central hub for the parish. For this project, the client opted to use laminate for the paneling and desk. The welcome desk actually incorporates two different kinds of laminates, as well as a three-form panel from an outside provider, all installed by Stanton Millworks. 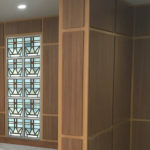 Stanton also worked closely with HGC Construction to create the wall with stained glass features. The HGC Project Manager came up with a way to reuse existing doors from the church and integrate them into the wall design, and Stanton Millworks constructed and installed the final product. Lighting is incorporated into the wall so that the windows are always illuminated. The final result created a warm and welcoming central hub where parishioners can gather, mingle, and access all of their buildings. See other Stanton Millworks projects for community spaces.